I'm sorry I have neglected you. It's been a long time — more than a month since I last paid you any attention. I know it's not an excuse but sometimes life gets in the way. Work. Family. The longer I waited, the harder it got to post again. I had to come up with something good. Something so bad it would justify the title of a poor old baseball card. I think I found something. I'm ready to post again. Okay, that's done with. 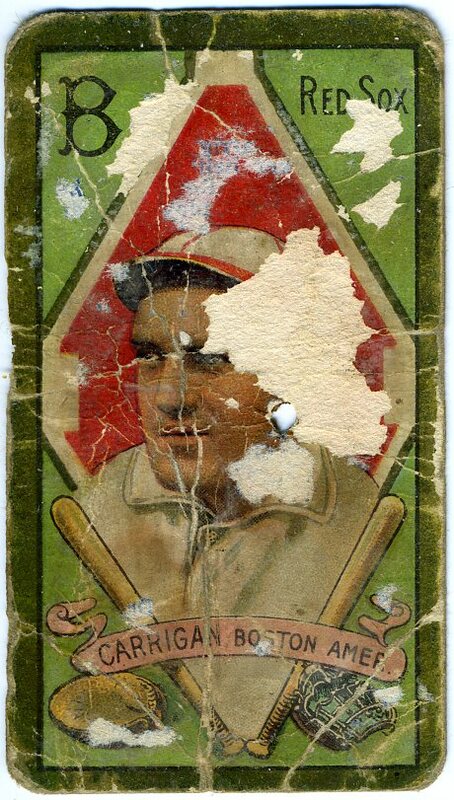 This Bill Carrigan has all the qualities of a poor old baseball card: Plenty of creases, rounding, chipping and let's not forget that hole. It's great! It's also a T205. A cousin to the famed T206 that we all know and love. This is my first T205. I haven't been avoiding them, I just never had one. How could I have avoided this beautiful set? I have a feeling there will be more of these gems in my future. I bet "T205" will be a regular search in my eBay bar. Oh, and by the way, I hope it won't be another month until my next posting.